ST. GEORGE — Newsweek recently ranked Success Academy at Southern Utah University in Cedar City the top school in its “Beating the Odds 2015” list and ranked Success Academy in Utah, which has programs at both SUU, Dixie State University and online, No. 18 in its “America’s Top High Schools 2015” listing. The annual “Beating the Odds” list identifies the 500 public high schools in the United States that are the best at preparing economically disadvantaged students for college. Both SUU and Dixie State University currently have Success Academy programs. In the listing, the academy received a 100 percent rating for all three categories, including college readiness, graduation rate and college bound. According to Newsweek, 44.9 percent of the program’s students live in poverty. Success Academy made its way to the top of its list by helping students graduate with both Associate of Science degrees from institutions such as Dixie State University and high school diplomas at the end of their senior years, thanks to concurrent enrollment. The annual “America’s Top High Schools 2015” list is Newsweek’s other listing that doesn’t factor in economic circumstances surrounding the schools’ students. In both lists, the academy was recognized for helping low-income students score at or above average on state assessments. To create the listing, Newsweek and its research partner, Westat to First, considered public high schools’ proficiency rates on standardized math and language arts tests to create an achievement index for each school. The ranking also factors in students’ college enrollment and high school graduation rates, advanced placement, international baccalaureate and dual enrollment involvement, weighted SAT/ACT scores, student retention rates and counselor-to-student ratio. Researchers looked at how many students are eligible for free or reduced-price lunches to measure student poverty levels. An acronym for Southern Utah Center for Computer, Engineering and Science Students, the academy teaches skills and knowledge that are in high demand in the workforce. The school, which aims to empower, encourage and engage students in the pursuit of academic excellence and citizenship, is open to all students. When more students sign up for the program than it can accommodate, students are selected to attend Success Academy via a lottery system. Success Academy was created in 2005 and is a partnership between the Iron and Washington county school districts and Dixie State and Southern Utah universities. The program is supported by the Bill and Melinda Gates foundation. 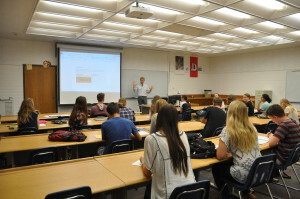 In Washington County, the early college high school offers its students concurrent enrollment in a Washington County School District high school and Dixie State University. As high school sophomores in their first year in the program, students are in a classroom with other Success Academy students on the Dixie State campus half the day and in their high schools the other half of the day. As they progress through the program, they eventually are on the DSU campus all day, taking a full load of college classes. As part of the program, students receive tuition waivers for the college courses they take through Success Academy.